(Nanowerk News) Commercially available hydrocarbons were used as templates to synthesize uniform graphene sheets using a series of sheet extending agents and a new transition metal catalyst, which were developed by Kyohei Ozaki, Katsuaki Kawasumi, Mari Shibata, Hideto Ito, and Professor Kenichiro Itami at Nagoya University's Institute of Transformative Bio-Molecules (ITbM) and of the JST-ERATO Itami Molecular Nanocarbon Project. Nanographenes, which are nanometer-sized graphenes, possess good semiconducting properties making them highly promising materials for the next generation of organic electronic devices. Itami and his team have developed a new catalytic one-shot annulative π (pi)-extension (APEX) reaction, which enables the rapid construction of nanographene in a single-step. The study, published online on February 16, 2015 in Nature Communications ("One-shot K-region-selective annulative π-extension for nanographene synthesis and functionalization"), illustrates the discovery of efficient sheet extending agents and a highly reactive palladium catalyst, making the APEX reaction highly applicable towards the 'growth from template' construction of a variety of nanographene structures as well as fine-tuning of their properties. The physical properties of nanographenes are mainly determined by their width, length and edge structures. Therefore, structural control on a nanometer-scale is highly desirable to access useful nanographenes. Many nanographene syntheses reported up to now involve a two-step sequence of (i) assembly of small aromatic components, followed by (ii) stitching (graphenization) of polycyclic precursors to make them into sheets. Although these methodologies have been useful, multiple steps are required for the assembly of molecules. In addition, incomplete stitching, side reactions and low yields have caused difficulty in the precise control for the synthesis of nanographenes. 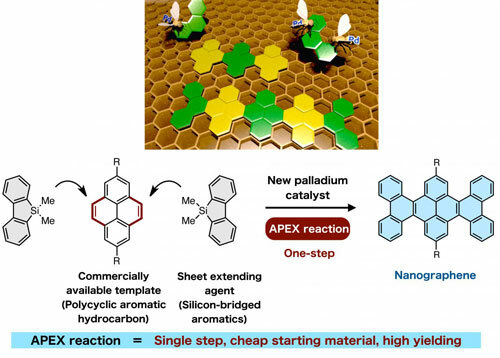 To overcome this, Itami and his co-workers have proposed a single-step APEX reaction, which involves selective attachment and annulation of an aromatic π-extending agent on a specific region of readily available polycyclic aromatic hydrocarbons (PAHs). Up until now, there have been no reported examples of APEX reactions conducted at the convex armchair edge of PAHs, otherwise known as the K region. Reactions at the K-region are considered to be difficult as other C-H positions are usually more prone to aromatic substitution reactions. "We started to work on developing APEX reactions when we found a palladium catalyst that led to selective arylation (attachment of an aromatic group) at the K-region," says Itami, the Director of ITbM and the JST-ERATO project. "After stitching, we were able to synthesize warped nanographenes in two-steps. Based on this insight, we envisaged that we could selectively activate the K-region and induce cyclization in one-step by careful choice of catalysts and reactants." "As far as we know, there have been no examples on the use of PAHs as starting materials for the synthesis of nanographenes," says Ito, a co-author of this study. "Although PAHs are relatively cheap and readily available, their relatively low reactivity and difficulty in selectively installing functionalities have limited their use as substrates," he adds. "Therefore, we carried out extensive screening of palladium salts, additives, and sheet (π)-extending agents to find the right combination of reagents that induced the APEX reaction on PAHs to generate uniform sheets of nanographene." "The most surprising part of this research was that a silicon-bridged aromatic compound could be used as a sheet extending agent for the APEX reaction," says Ozaki and Kawasumi, graduate students of Nagoya University who conducted the experiments. "The silicon-bridged molecule was a product of a reaction, in which we were actually expecting a different product. Because we had the molecule in hand, we decided to use it in the catalytic system and coincidently found that selective annulation at the K-region had occurred." In order to investigate the nature of this APEX reaction, computational studies using density functional theory calculations were conducted on a model reaction. "We predict that the selectivity of the APEX reaction arises from the K-region π-bond having the least aromatic character compared to other sites," says Shibata, who performed the theoretical calculations. "Further computational studies will be carried out to find more details on what is actually happening in the APEX reaction." Functional handles, such as chloride and boryl groups on the substrates were compatible under the APEX reaction conditions, which makes the products ready for further functionalization. The synthetic utility of the APEX reaction was also demonstrated by examining multiple and sequential APEX reactions to successfully access larger nanographene frameworks on a multi-gram scale. "The most difficult part of this research was by far the solubility issue that we had with handling the nanographene products," says Ozaki and Ito. "Most of them were insoluble in the solvents that we tried. However, I was sure that I could make this reaction better and I believe that it was my determination to accomplish the precisely controlled synthesis of nanographenes that finally led to this outcome," continues Ozaki. "Through the development of the APEX reaction, we have succeeded in the direction-controlled growth of nanographene sheets from PAHs," says Itami. "We believe that this methodology will lead to the synthesis of uniform nanographenes that are essential for future nanomaterial devices, and will also be applicable for constructing other exciting conjugated structures in a rapid and programmable manner."